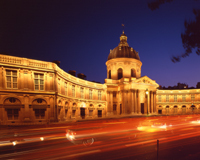 The Academy of Sciences of Paris has its origins at a time when Superintendent, Comptroller General, Jean-Baptiste COLBERT, planned to create an academy of general calling. This was in keeping with the heritage of various groups of scholars who, during the 17th Century, met around a patron or a learned personality. Colbert chose a small group of scholars who met on December 22, 1666 in the King Louis XIV's library, recently installed in rue Vivienne, Paris and where they then held twice-weekly meetings. The first 30 years of the Academy's existence were relatively informal, since no statutes had been established for the institution. On 20 January 1699, Louis XIV gave the Company its first rules. The Academy received the title of Royal Academy of Sciences and was installed in the Louvre in Paris. Comprising 70 members, in the 18th Century it contributed to the scientific movement of its time through its publications and played a role as counsellor to those in power. On 8 August 1793, the Convention abolished all the academies. Two years later, on August 22, 1795, the National Institute of Sciences and Arts was created, bringing together the former academies of the sciences, literature and arts. The Institute's first so-called 'class' or division (physical sciences and mathematics) was the largest (66 out of 144 Members). In 1805, the National Institute of Sciences and Arts was transferred to the premises of the College of the Four Nations. In 1816, the Academy of Sciences became autonomous, while forming part of the Institute of France ; the head of State remained [and still is] its patron. In 1835, under the influence of François ARAGO, the Comptes Rendus [Proceedings] of the Academy of Sciences were inaugurated and became an instrument of prime importance for the dissemination of French and foreign scientific studies. At the beginning of the 20th Century, the Academy observed a decline in its activities and influence - already been triggered by demographic reasons. In the face of accelerated development of scientific research in France and in order to remain faithful to its calling, the Academy adapted its structures and its missions. Indeed, it recently initiated a deep-reaching reform of its statutes, concerning Membership and Missions. The first part of this reform, approved by decree on May 2, 2002 (cf. publication in the Journal Officiel N° 104; May 4, 2002), led to the election of 26 new Members in 2002 and in 2003. The second part of the reform was approved by the decree on January 31, 2003 (cf. publication in the Journal Officiel N° 28, February 2, 2003).